The first-light spectrum from the MinXSS-2 X123-FastSDD (green spectrum) has about 0.1 keV FWHM energy resolution for the Si XIII emission line at 1.85 keV. This energy resolution is about a factor of two better than the MinXSS-1 X123-SDD observations (black spectrum). These spectra are for a quiet Sun condition; there are dozens of other emission lines that become bright during solar flares. The Miniature X-ray Solar Spectrometer #2 (MinXSS-2) CubeSat was launched on December 3, 2018, as part of the Spaceflight SSO-A mission, on a SpaceX Falcon 9 rocket. The original MinXSS operated between May 2016 and May 2017, limited in its mission life by starting at a low altitude (approximately 400 km) after being deployed from the International Space Station. Both MinXSS missions were designed to study solar variability in soft (low-energy) X-rays, the energetics and dynamics of solar flares, and solar impacts on Earth’s upper atmosphere. A key improvement for MinXSS-2 is an enhanced instrument to measure the solar soft X-ray spectra with higher energy resolution, which will enable new studies of flare dynamics and mechanisms for heating the solar corona to millions of degrees. Additionally, MinXSS-2 is in a Sun-synchronous orbit at an altitude near 580 km, providing a longer orbital lifetime. The MinXSS-2 mission is expected to be several years long and will contribute to studies of the 11-year solar cycle variability. The MinXSS team finished spacecraft commissioning in five days and obtained “first light” observations on December 7. The primary instrument aboard MinXSS is the Amptek X123 Fast-SDD spectrometer to measure the solar soft X-ray spectral irradiance from 0.5 keV to more than 20 keV. The MinXSS-2 X123 energy resolution is enhanced by about a factor of two over that for the MinXSS-1 X123, as illustrated in Figure 1. 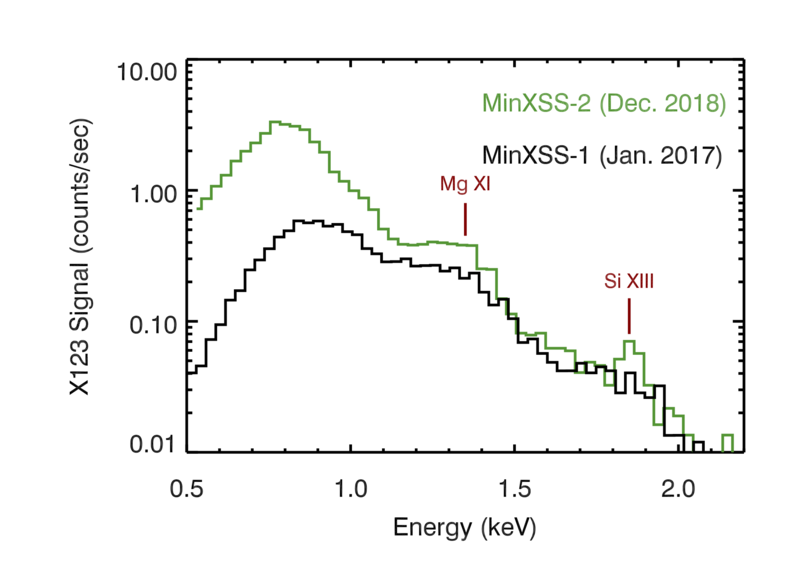 MinXSS-2 also has higher sensitivity for lower energy photons below about 1.5 keV compared to MinXSS-1. The MinXSS team is excited for the new MinXSS-2 mission, its improved instrumentation, and the opportunity for a longer mission than MinXSS-1. We thank the dedicated integration and launch teams from Spaceflight and SpaceX for this very successful launch, the many engineers and students at the University of Colorado Boulder for designing, building, and preparing MinXSS-2 for flight, the sponsorship for the launch services by Planet (previously Google/Skybox), and the sponsorship for the MinXSS development and operations by NASA. More information about MinXSS can be found on the mission website at http://lasp.colorado.edu/home/minxss/.